Posted by Cyril. April 28th 2016. Norfolk Terriers are small dogs with big personalities. Known for being alert, lively, fearless and loyal, the scruffy-looking dogs are hard not to love. Norfolk Terrier puppies and dogs are affectionate and loving family dogs, but also have the spirit of a hunter and love to chase rabbits, foxes and vermin. They have a scrappy, tenacious nature but can live happily in a family with children and other pets, especially if they have been raised with them. Unlike other terriers, Norfolks are not overly yappy but will still bark when something attracts their attention. As the name suggests, the breed was developed in East Anglia, where, in the 1800s, it was used by families to work on farms and hunt for small animals. It is thought the breed stems from crossing Border, Cairn and Irish Terriers and, in the latter stages of the 19th century Norfolks were used by students at Cambridge University to help solve their rat problem. 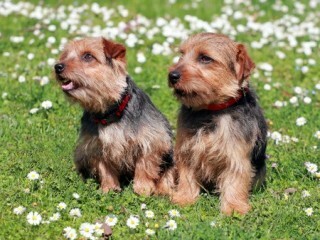 Then, the breed was referred to as Cantab Terriers and Trumpington Terriers and most of the terriers were red in colour. Several influential dog owners began to refine the breed and Frank Jones was the man responsible for handing out the name Norwich Terrier. The Norwich Terrier was accepted into the English Kennel Clun in 1932 but did not reclassify the droopy-eared version as a Norfolk Terrier until 1964. Average males and females are about equal in size, between 9ins and 10ins tall, weighing up to 13lbs. Norfolk Terrier puppies and dogs have strong legs with a short body, with rounded heads and a short muzzle. They look a lot like Norwich Terriers but were recognised as a separate breed in the 1960s. The main discernable difference is the ears. Norfolks have slightly rounded ears that droop. The coat is double-layered, with the outer coat made up of wiry hair between 3cm and 5cms long. The coat appears in various shades from deep reds, to light browns and blacks, with or without white patches. Their heritage as working dogs gives Norfolk Terriers a tenacious and independent streak, but they are among the softest of the terrier group, along with Norwich and Borders. This makes them good companion dogs and they love being part of a family. They are good-natured, alert and always ready to play. They are always on the lookout for something to investigate, which will keep owners on their toes. Terriers will initially bark at strangers but will soon calm down when it becomes clear there is no threat. Norfolks will instinctively chase small animals such as rabbits so should be kept close by when out in open spaces. 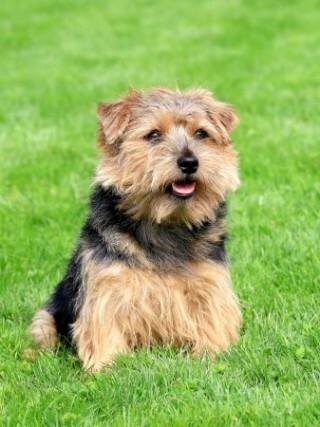 Norfolk Terriers are among the easiest breeds of dog to take care of. They can adapt easily to most living conditions, from flats to farms and require little grooming. The hair must be brushed regularly and trimmed a couple of times each year. A bath every few weeks will suffice but, because of their love of digging and chasing, owners might find more frequent washing is necessary. A good half-hour walk or play session each day will be enough but they will happily do more. Norfolk Terriers are intelligent and love to learn new tricks. Like most dogs, they benefit from consistent and positive training. Their sensitive nature means Norfolk Terrier puppies and dogs do not respond well to being shouted at – this may cause them to become nervous and apprehensive. Like most terriers, they will bark but can usually be calmed down with a simple instruction. When it comes to feeding Norfolk Terriers, provide two meals of high-quality dry food a day. The amount your dog needs will depend on their size and how active they are. It’s important to keep monitor your dog’s weight – you should be able to feel but not see the ribs and a slender waistline should be visible. Don’t give out too many treats and don’t be tempted to feed your Norfolk leftovers from your own meals. Norfolks are a generally healthy breed but is prone to some conditions, including mitral valve disease (MVD). MVD can be a life-threatening heart issue. Reputable breeders will test for the condition and dogs with the syndrome should not be bred. Like many breeds of dogs, Norfolks are also susceptible to hip dysplasia, a problem with the joints that limits movement. The life expectancy of a Norfolk Terrier is between eight and 14 years. The breed is renowned for its hardy nature and many live into their late teens. Litters are normally small to medium.